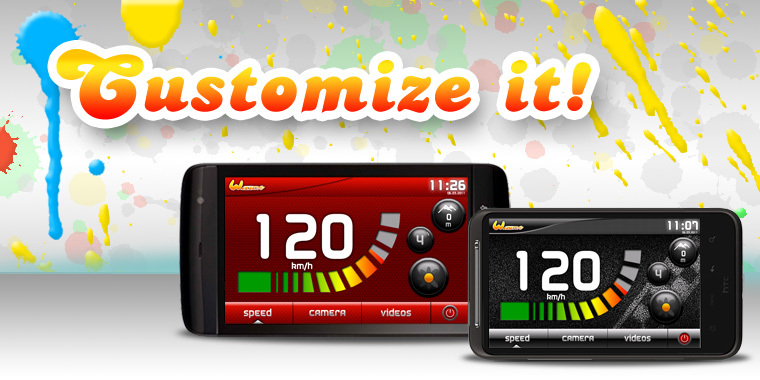 The Garage is the place to learn how to customize your Wizzmo. How to change the honk sound? In order to impress the people outside while riding, you can easily change the sound of your honk. To realize this find some cool honk sounds encoded in mp3 (We suggest to have a look at http://www.freesound.org or http://www.soundbible.com) and rename it to honk.mp3. Your new file should be then placed under /sdcard/wizzmo/sounds/honk.mp3. Press the Camera tab and select the Pimp mode. Enjoy your new honk sound! How to load my cool videos in Wizzmo? Place your favorite FLV videos (e.g. downloaded from YouTube) on your SDCard and launch Wizzmo. Wizzmo will directly find and display your videos when you press on the video tab. 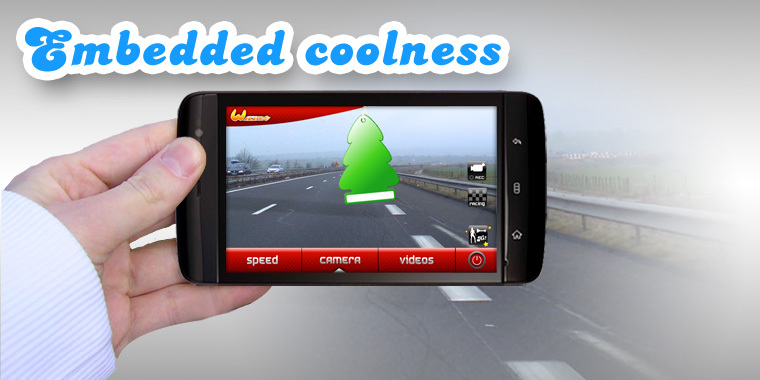 Depending on the power of your Android device, be sure to download/encode videos in (240 or 360p). Of course if you have a powerful Android device you can also playback HD FLV videos! (Adobe AIR 2.6 supports HD). To encode your favorite videos in FLV, you can follow this Adobe tutorial or look for "FLV encoder" in your favorite search engine. 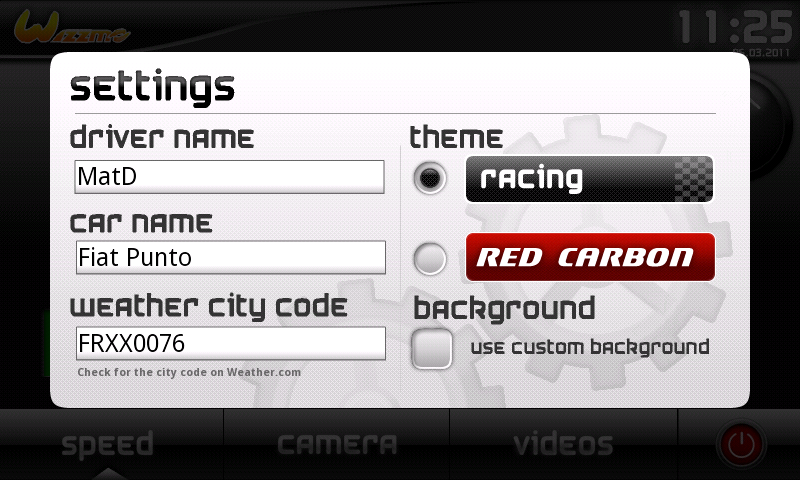 Press on "MENU" and in the Settings box you can edit the weather city code. In order to retrieve it, go to Weather.com and look for your city.Once you found it, check the URL in the browser's address bar. You will notice a code (e.g. New York City: USNY0996). Paste this code in the box and re-press on "MENU" to save the settings. It's pretty easy: go to sdcard/wizzmo/background and paste your favorite picture in this directory. In order for Wizzmo to recognize it, rename it background.png. And to unleash your creativity you can also use PNG alpha layers to make some real cool graphical effects. I want new cool backgrounds! In the Download section you will find some cool backgrounds. 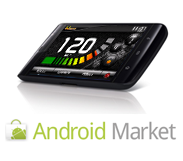 Get Wizzmo exclusively on the Android Market. 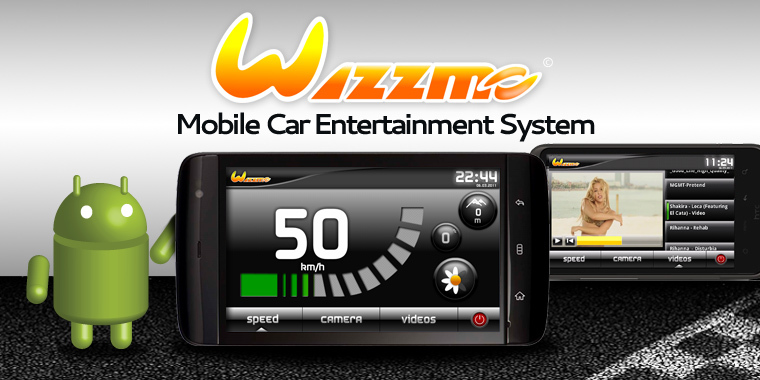 Follow us on Twitter to get the latest updates and news about your car entertainment system.